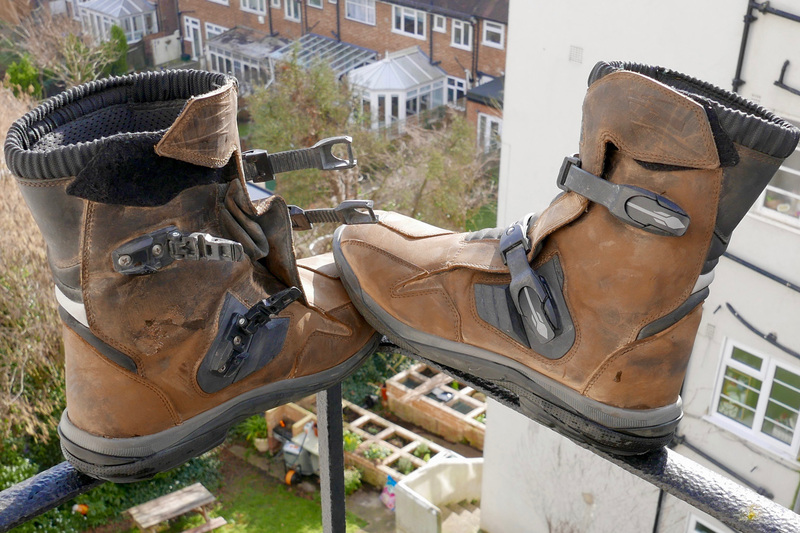 My old Altberg road boots (right) were showing the years. 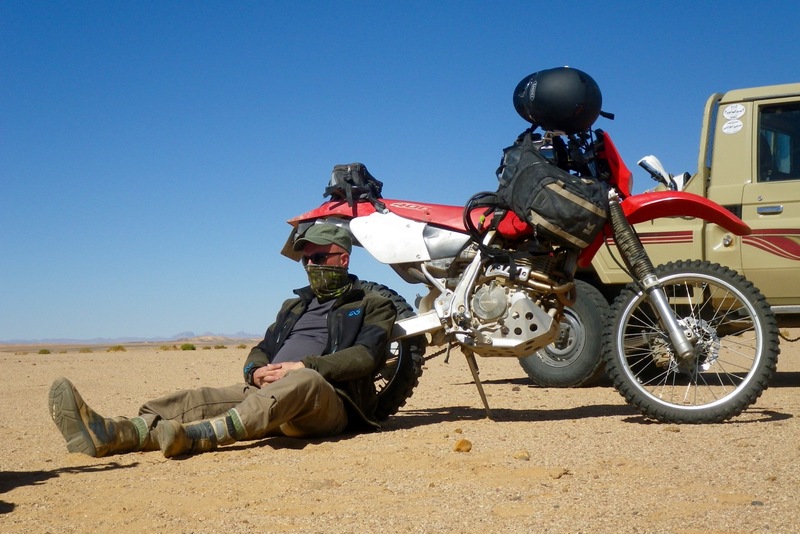 Bought from a junk shop for 20 quid, they were OK for my Morocco tours but didn’t have the solid protection nor a stiff on-the-footrests instep for a two-weeker in Algeria on an XR400. 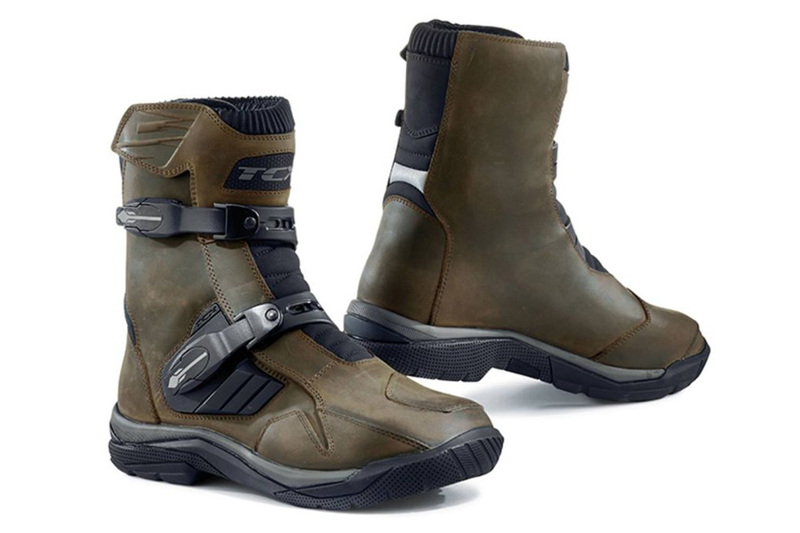 I’ve been eyeing up the Italian TCX brand, in particular the Baja Mids from the ‘Touring – Adventure’ line looked good in natural hide and looked like they fitted my needs. 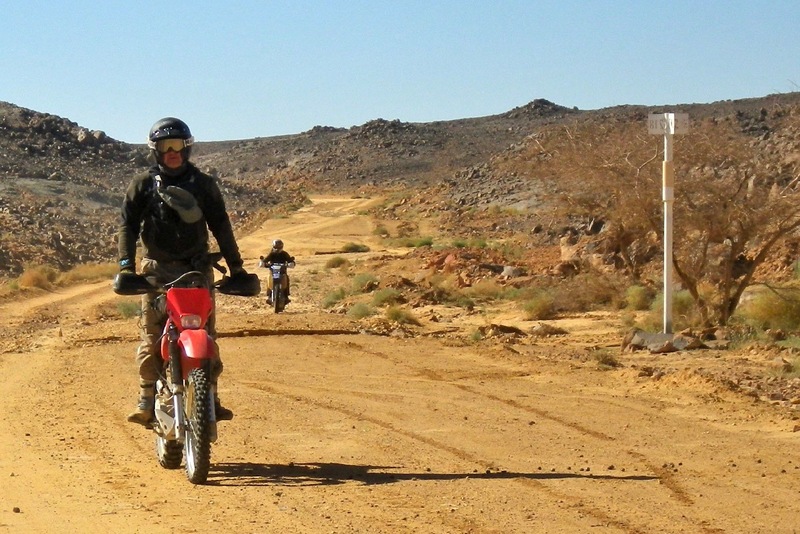 For my sort of non-competitive desert riding I don’t believe a full-height MX boot are really necessary. Looking back I see I only wore such things (Alpine Stars; right) on my very first desert trip in 1982. 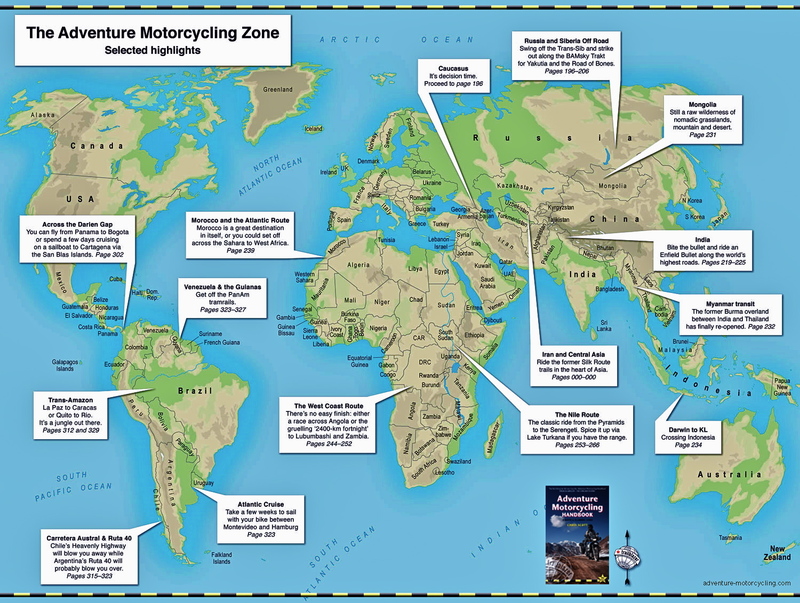 In the real world I’m not blasting through shallow rivers or showers of stones on my way to the chequered flag, but solid ankle support and foot protection are important for any form of biking, particularly off-road where a typical slow speed fall over often sees the bike drop on your foot (as happened to a rider on our trip, cooling his sore foot, right). 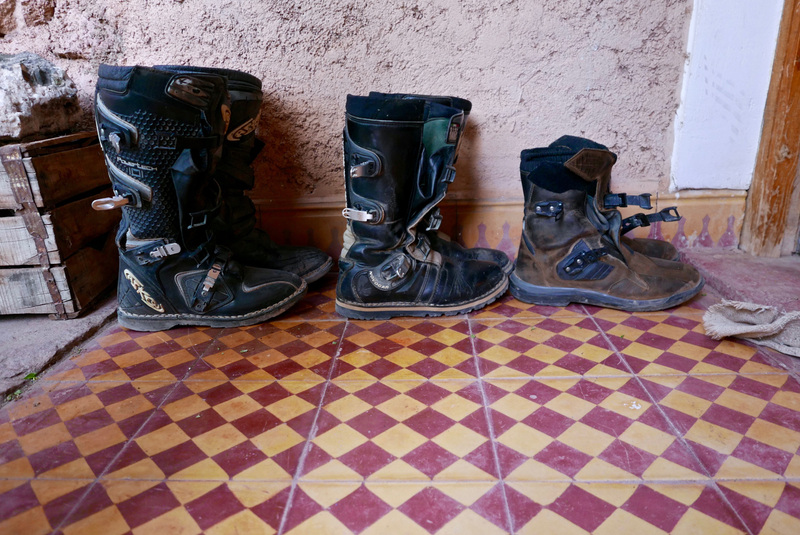 After another crippling accident on our ride a couple of us wondered whether in a foot-catching-a-rut prang a solid, full-height MX boots transfer more twisting force to the knee than a mid-height boot like my Baja which lets the shin bones twist a bit before a knee ligaments snaps. 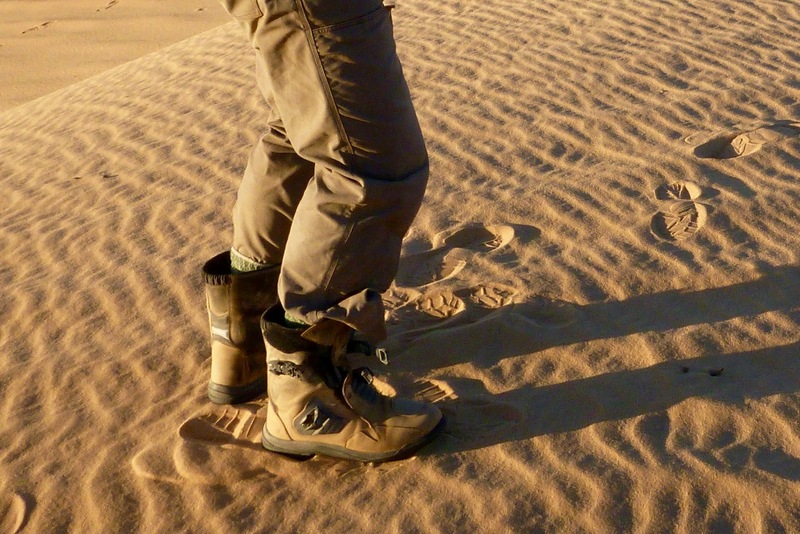 I’ve had problems with narrow hiking boots, over the years but the size 11 Bajas fitted me just right. 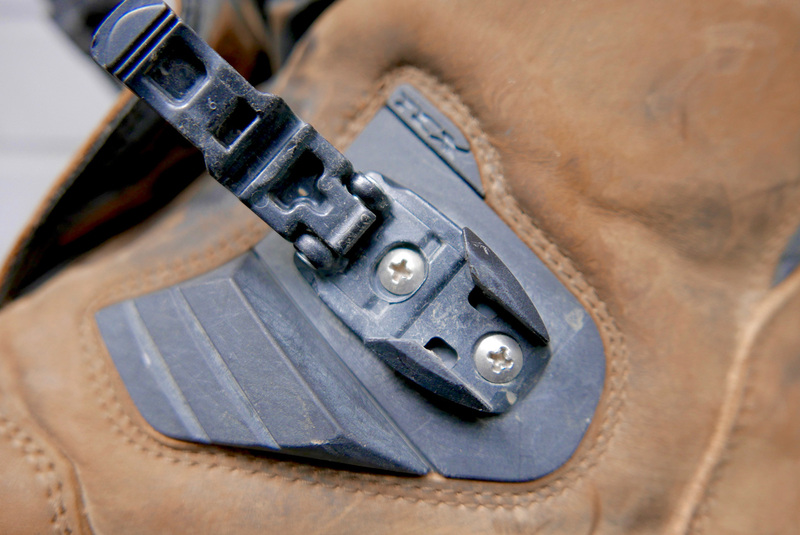 Your foot slips smoothly into the padded lining where you can replace the basic footbed to suit your needs, though for bike riding they’re not that critical Everything clamps down with two micro-adjustable buckles which look like they could take the odd whack from a rock and are replaceable once they don’t. This is all a lot less faff than the zips on my old Altbergs which have lasted, but occasionally refused to budge until you reboot, so to speak. Being mid-height means tucked-in trousers may tuck-out on the move. 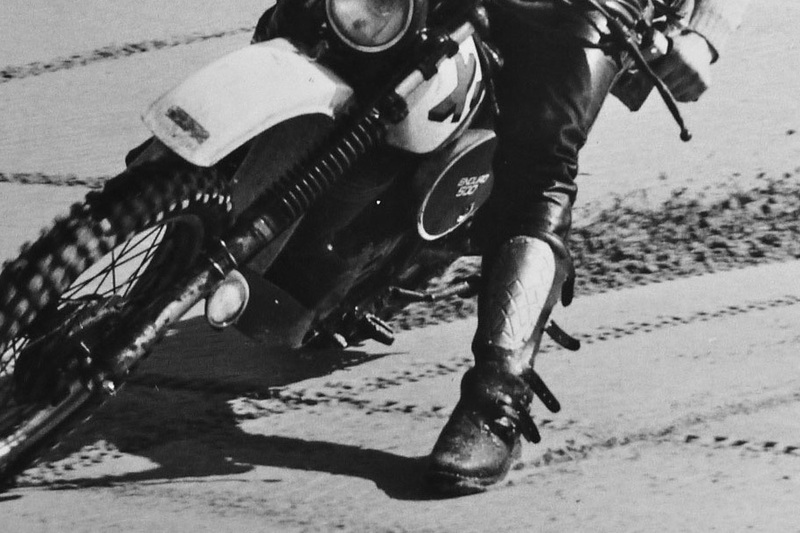 I also found if wearing short socks the padded edge of the upper collar chaffs on bare shins, as any boot would. The solution is knee-high socks or as I did, tuck trouser-ends into the short socks. Or of course you can wear them OTB for hipster soirees. Being short, they’re light too at just over a kilo each, same as my Lowa desert boots. 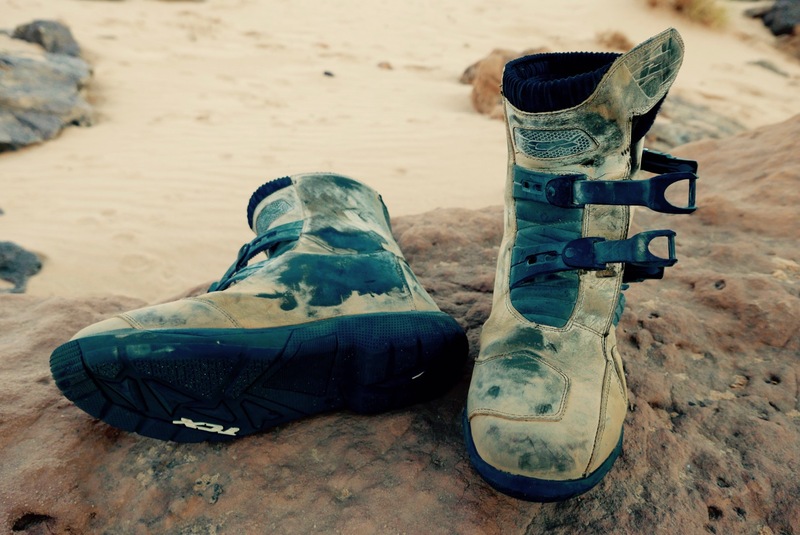 I never had that encumbered, boxy feeling I recall from full-height MX boots. 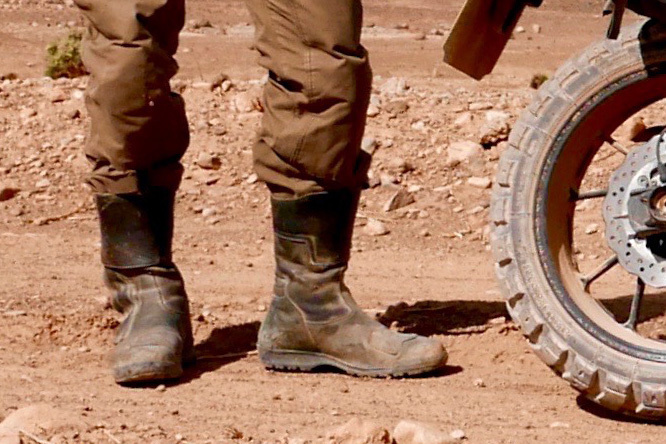 When it came to standing and riding over rough terrain, with larger-than-standard pegs the Bajas supported my feet comfortably and with no pressure, just like a proper MX boot. 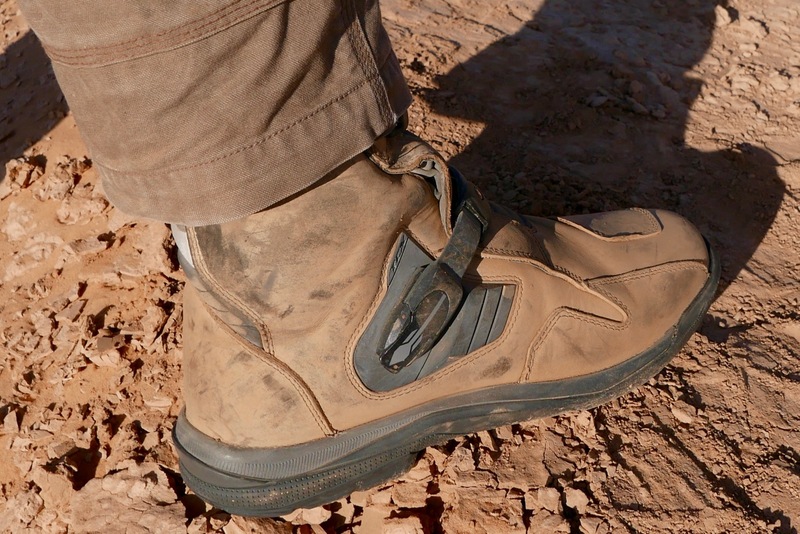 I’ve yet to test the Baja’s waterproofness but noticed in the desert they never became uncomfortably clammy to wear which suggests a more breathable, higher quality membrane. 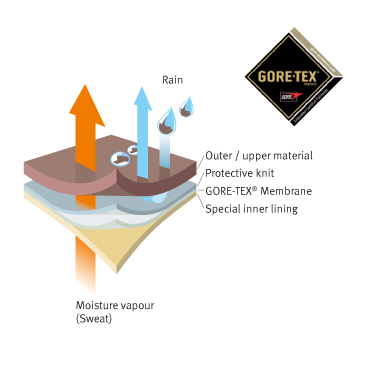 There’s no word what it is on the Baja description, but TCX’s generic Gore-Tex page suggests all TCX boots use one grade of Gore-Tex or another. In my experience, cheaper membranes err towards waterproofedness rather than true breathability which results in clamminess round the clock. Looking forward to more long rides in my Bajas. More thoughts here.